Naomi and Ruth – there’s a famine in the land, so Elimelech and Naomi, husband and wife, leave their home town of Bethlehem and settle in Moab (outside of the Promised Land), with their two sons, Mahlon and Kilion. Elimelech dies, and whilst their sons marry Moabite women, they too die after about ten years, leaving three widows. There are better reports coming out of Bethlehem, so Naomi decides to return ‘home’, and her two daughters-in-law venture with her. There’s an excitement in Bethlehem when Naomi arrives, people are so pleased to see her back. But she is different these days. Her joy is gone. Her love of life has been replaced with a look of bitterness, of hardship. Life has been very cruel to her – worse than that, Naomi believes the Lord has been hard and cruel to her, bringing her back empty-handed, and broken-hearted. She wants people to call her ‘Mara’, which means ‘bitter’. So, they arrive in Bethlehem, just as the harvest is ripe for gathering. Ruth Meets Boaz – Naomi and Ruth, as widows, returning after a long time away (and Ruth an outsider), are destitute and are dependent upon the provisions made for the poor in Israelite law. Ruth goes out to glean the scraps of grain which are left on the ground as the harvesters do their work. By some strange coincidence (God-incidence), she finds herself in Boaz’s field (Boaz is a relative of Elimelech, Ruth’s father-in-law). ‘The bless you’, is the reply from his workforce. Mark Greene (LICC) writes a brilliant article around this interchange between boss and workers. The phrase ‘The Lord be with you’ is heard most often these days in church / cathedral, where a priest / vicar / minister uses the words with the congregation. But these words originate in scripture from the workplace, and indicate a real connection for Boaz between his faith and his work. If God is blessing him and his workers, then the work of the day will be truly blessed ! Again, after the last chapters of Judges, Boaz stands out as a man of faith, integrity, and godliness. Boaz shows interest in this poor young woman and is told she is the Moabite, Ruth. It has been noticed how hard she has been working for herself and Naomi. Boaz speaks to Ruth, and offers her the protection of his field – he’s instructed his workers to look after her, where she would be very vulnerable to attack and abuse in other fields, as a poor outsider. She is also allowed to drink the fresh water reserved for his workers. When Ruth asks why he is showing such kindness towards her, Boaz says it is reward for the kindness she has shown to Naomi. 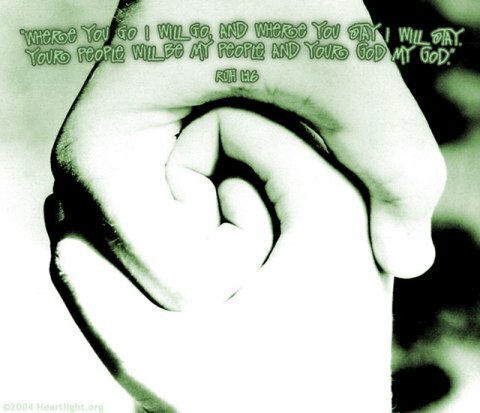 A beautiful prayer-filled desire Boaz has for Ruth. Even at meal time, Boaz includes her (bread and wine !! Mmm), and then he is generous towards her by asking his workers to make sure she gets some of the best stalks, by dropping some of those along the way. At the end of the day, Ruth returns to Naomi with such a lot of grain, and the left-over food from meal time. As they ate and talked together, Ruth told of Boaz’s kindness, and Naomi recognises that Boaz is one of their relatives, and proclaims a blessing upon him. So, Ruth continued to work safely each day till the end of the harvest, thanks to Boaz’s generosity and kindness. 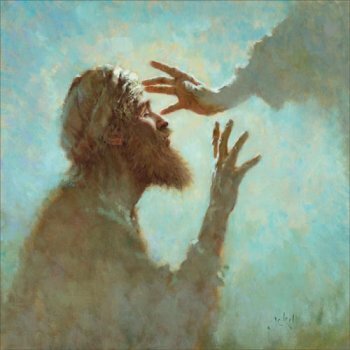 Jesus Heals a Man Born Blind – there’s another teaching moment for his disciples as they pass a man born blind. The question in the disciples’ minds is, ‘who sinned, this man or his parents, that he was born blind’. Jesus immediately teaches that this man’s blindness is not punishment for the sin of either the man or his parents, but for some glorious purpose of God’s. Jesus is about to show a sign that He truly is ‘Light for the World’. Jesus makes some mud with his spit and puts it on the man’s eyes, telling him to go and wash in the Pool of Siloam (which means ‘Sent’). The man did this and was given his sight. Some recognise him and others don’t, but those who do ask him how it all happened. He tells them the facts – spit, mud, eyes, wash, and now he can see. When asked, however, who had done this for him, he didn’t know. No idea it was Jesus – not even His name! The Pharisees Investigate the Healing – enter the Pharisees…they pick up on the fact that this has all happened on the Sabbath. The man who has received his sight will go only as far as saying he thinks his healer is a ‘prophet’. The Pharisees need to test out this man’s story, so they fetch his parents, and check out with them about their son’s blindness. They confirm that he is their son, and that he had been born blind. Out of fear of punishment from the Jews, however, they wouldn’t be drawn on who had done this, and what they thought of Jesus. So they speak with the healed man again, and try to get him to admit that Jesus is a sinner. I am reminded of the words of Amazing Grace, and that there is no denying the gracious, healing work of God in a person’s life, wherever they are on their journey of faith in Jesus. ‘You were steeped in sin at birth; how dare you lecture us!’ And they threw him out. Poor guy – he hadn’t even asked for healing – but all this is to reveal God’s glory, Jesus says. Maybe, the glory of God is even revealed by standing against the hypocrisy and self-righteous vindictiveness of the religious elite.